Updated February 9, 2019--- Before you know it the 2019 rodeo season will be in full swing.The CWWRA board has spent countless hours since the 2018 finals rodeo planning for a great 2019 Carbondale Wild West Rodeo season.One of the main responsibilities of the board is acquiring sponsorships. The rodeo would not be possible without the generosity of our tremendous sponsors. The 2019 Carbondale Wild West Rodeo Event Sponsorships Are Going Fast; however, we do have a need for more sponsors! The deadline to sponsor in 2019 is March 31st for any remaining available sponsorships. We're extra excited that this year July 4th, Independence Day is on Thursday night. We always have special activities the rodeo closest to the 4th. This year should draw more spectators. We will be updating any main events sponsorships if and when they become available. Carbondale Wild West Rodeo Sponsorships are a great advertising opportunity that reaches a large audience for 12 weeks of the summer and all passing traffic year round. On behalf of the Carbondale Wild West Rodeo Association, we would like to sincerely thank you for your interest in becoming a sponsor. Sponsors play a very important part in the success of our rodeo season, as most individual rodeos are a money-losing proposition. The funds from sponsors help to bridge that gap. Without sponsors, we do not have a rodeo. In return for your support, we would like to let you know the value and benefit of being a sponsor of the rodeo. Sponsoring the Carbondale Wild West Rodeo is an effective and affordable to way to reach your customers in the Roaring Fork Valley and beyond. With a sponsorship you get weekly exposure during the Rodeo to an average attendance of 1,000 spectators who are residents and visitors of our valley. In addition, your signs will be viewed at multiple arena events throughout the year and by thousands of motorists who pass by on County Road 100. Please see the attached sheet for the different levels of sponsorship. Not all of these levels may be available, as we offer our existing sponsors the right of first refusal. Please contact Mike Kennedy (contact information is listed below) to determine if the sponsorship level that you are interested is available. •	A 4' x 4' sign in the arena (Sponsors are responsible for having their own signs made) and an ad in event program. Ad size varies on sponsorship level. •	Your business and/or family name listed on the CWWRA website with a link to your website and listing of your contact information. Check it out at www.carbondalerodeo.com!! •	CWWRA now has a Facebook page which offers further recognition of our sponsors throughout the rodeo season. We currently have over 7500 "likes"!! •	Free Individual event tickets for the rodeo. Number of tickets varies on sponsorship level. Once you have reached out to Mike and confirmed that the sponsorship level is available, please send a check payable to: "Carbondale Wild West Rodeo Association". Mail your checks to: CWWRA, PO Box 1739, Carbondale, CO 81623. Available are Premium Sponsorships, General Sponsorships, and Friends of the Rodeo. There are a limited number of Events Sponsorships remaining. Please see the attached sheet for the different levels of sponsorship (link at bottom of page). Not all of the Event Sponsorships may be available, as we offer our existing sponsors the right of first refusal. Also, a limited number of $650 and $750 level sponsorships are still available. These are all great opportunities to showcase your business in the valley, or to let the community know how much your family cares about continuing the great tradition of the Carbondale Wild West Rodeo. Please contact Mike Kennedy (the contact information is listed below) to determine if the sponsorship level that you are interested in is available. Sponsorships sell out quickly, so please reach out as soon as possible to reserve your sponsorship. The deadline this year is March 31st. If you would like to have a website link or an ad in the program, please enclose that information with your check. We sincerely appreciate your interest and sponsorship of the 2019 Carbondale Wild West Rodeo Series. As mentioned before, without all of our sponsors, our rodeo would not happen! 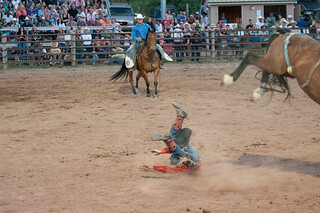 The Carbondale Wild West Rodeo Association (CWWRA) is a not for profit, volunteer organization committed to keeping the Roaring Fork Valley’s western heritage alive by offering a fun, family oriented rodeo. Along with the financial obligations of running the rodeo, CWWRA invests funds back into the rodeo facilities and contributes portions of gate monies to worthy organizations in the community. Your CWWRA board members are Pres. Mike Kennedy, V. Pres. vacant, Sec. Melanie Cardiff,Treas. Tom Harrington and Member at Large Mike Goscha. The CWWRA is managed by this all-volunteer board of directors who receive no financial compensation. Call Mike Kennedy, CWWRA Board Pres. (970 379-3907) and Mike will help you to find the right sponsorship opportunity for you. The Carbondale Wild West Rodeo has enjoyed continued steady growth year after year. We are proud to once again bring you a “Small Town Rodeo, Big Time Fun!” However, without the help of sponsors we couldn’t offer the caliber of rodeo that our spectators and participants have come to enjoy year after year. Sponsors play a very important role by making it possible for the Carbondale Wild West Rodeo Association (CWWRA) to bring this very successful event to the Western Slope. We hope you will consider being a sponsor for the 2019 rodeo season.